My mom used to prepare this refreshing salad quite often when I was a kid. I figured I’ll post it here. It consists of approximately equal parts of apples and carrots. The resulting mixture has a very nice sweet taste (from the apple), and is also quite juicy. Take an apple (jablko) and few carrots (mrkva, pl. mrkvy). Sweet and juicy apples work the best. I believe I used the McIntosh variety here. 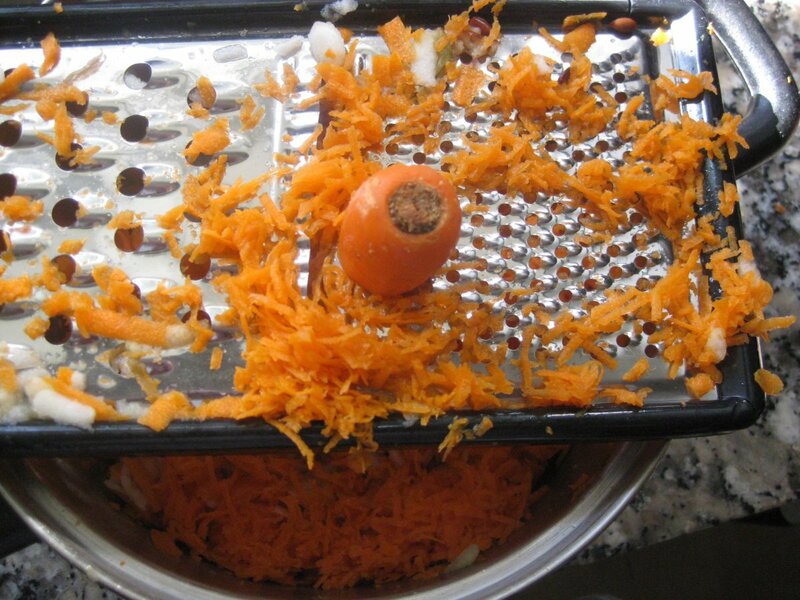 Remove the stem and peel the carrots. You can also peel the apple but from my personal experience this is not necessary. Grating will take care of this on its own. 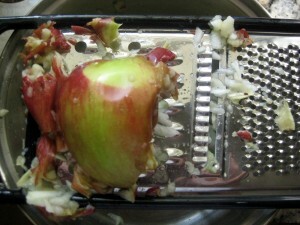 Then using a food grater, shred the apples and the carrots. 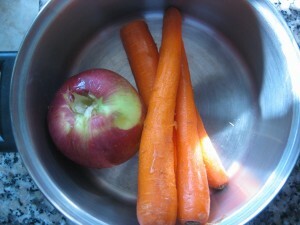 Use the wider setting for the apple and the finer one for the carrots. And that’s it. If the salad ends up bit too on the carroty side (and not sweet enough), simply add bit more apple. Another popular Slovak side salad is the cucumber salad. I will be adding a recipe to it shortly. I make this salad all the time. Unfortunately, I’ll make enough for 6 people and eat it all by myself. I love it! One thing you can add to make it easier to digest is a bit of orange or lemon juice. If you do that, you can even skip the apple. 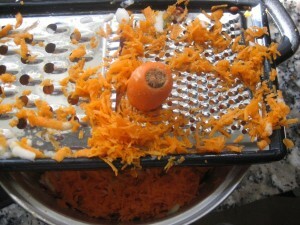 I grate my apple on the fine side (same as the carrots) and it lets out a lot of juice. If I’m lazy, I just do the juice and carrots. But it’s good to add lemon juice if you have the apple to keep it from turning brown. And it still tastes great! Nope, no dressing or seasoning. It has a refreshing sweet taste by itself, and would not really blend well with salt or pepper. 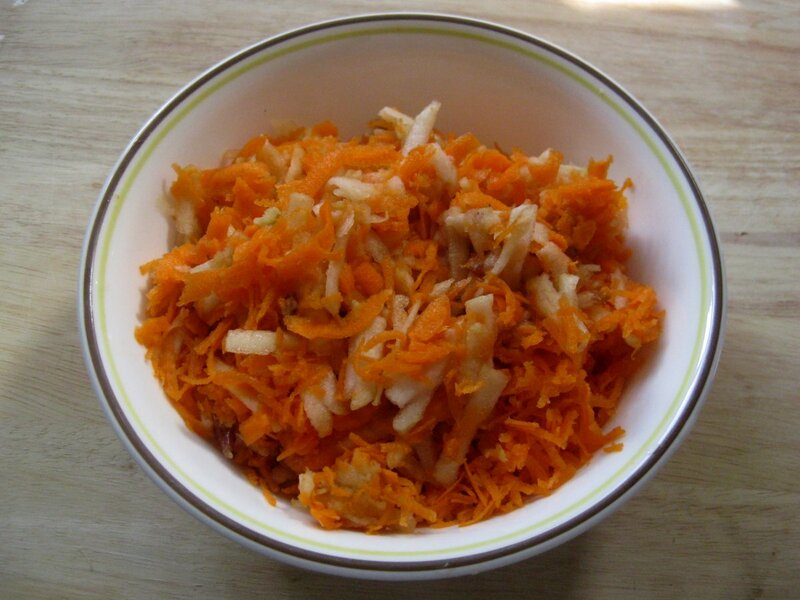 I make this salad for my daughter when she constipated and after we eat the salad she is good to go.Good old Slovak recipe.The fiber in apple and carrots is good for kids. v CR jsem vyrustala na ‘mrkvovem salatu’ – najemno nastrouhana mrkev, jablka, smichat s citronovou stavou a popr. medem. znate to? v CR ma kazda domacnost nejaky mixer, co dokaze mrkev najemno nastrouhat (musi byt najemno). stejne struhadlo jsme pouzivali na bramborak. problem je v tom, ze tady v USA nemuzu elektricke struhadlo co strouha najemno sehnat, takze to musim strouhat rucne. nevite o necem, co by mi natrouhalo mrkev nejemno? diky.